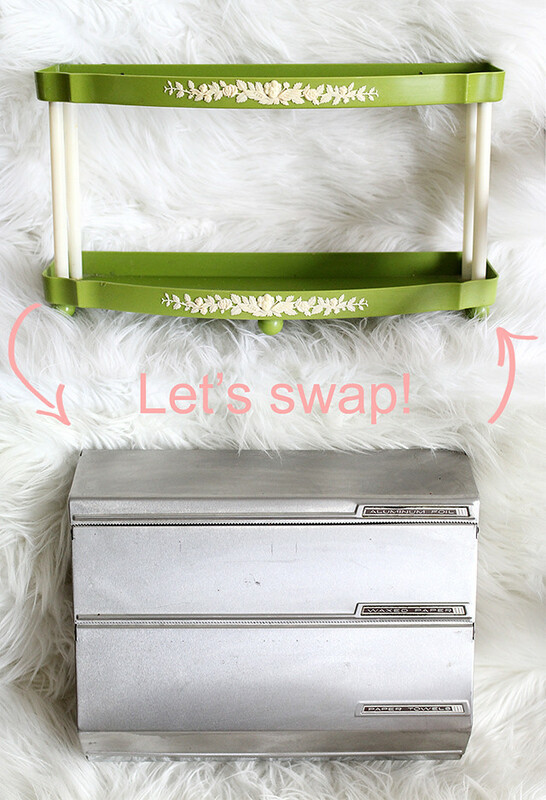 Skunkboy Blog: Let's Swap Home Stuff! You've already heard me talk about swapping clothes on Swapdom, then came kid's stuff, and now we can swap home goods on the site! They have a new section launching today for home stuff and I'm pretty excited to do some trading. You can find me right here if you want to browse my profile-- I'll be uploading more stuff throughout the week! Have you tried Swapdom yet? I need to share some of my favorite swaps with you soon! I've found some real treasures there! I always see that vintage paper dispenser in our local antique stores. It sure is cute, but sure is small! Our products have pretty well tripled in size compared to those a few decades ago. However, it's still a nice unit to have in any kitchen. Now THIS I may have to try out because I have a lot of unique pieces I have inherited over the years, but not all of them are necessarily "me", but someone would love them! Randomly, I totally have that same foil/waxed paper/paper towel dispenser! It hung on my grandmother's wall as long as I can remember, and when she passed last year it was one of the things I HAD to save. How long does your stuff usually sit for until it is swapped? That's such a neat idea! I don't know if I have enough home stuff to start swapping things, but the clothes I'm sure I do! I signed up so excited only to find it's US only - major bummer! Hopefully they expand soon! This is so great! I'm so happy they have a section for home goods now! I'm going to have to get to swapping soon! !